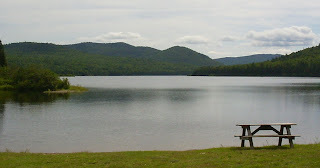 This will be my last post until around Aug 3rd, as we are leaving for the family cottage in PEI tomorrow morning, and then, next week we are heading for Lunenburg where my son lives. I am not techno savvy enough yet, nor am I sure I'll ever be, to leave automatic postings for while I'm away. Here is a photo of the sketch that I mentioned yesterday. 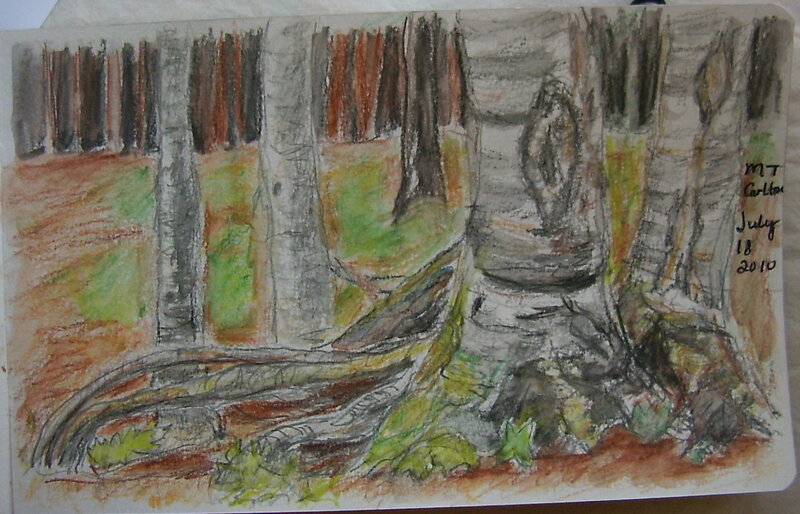 It was done just before dark at our campsite using watercolor pencils. I put water and brush to it today. We just got back from our quick 2 nights at Mount Carlton this afternoon. It was lovely there, but definitely much warmer here in town. The weather there was great, although a little unsettled yesterday, so I didn't get my usual sketching done. We were kayaking for about 3 hours on the lake yesterday, and it rained twice. It was a warm rain though, that came in suddenly and then passed. 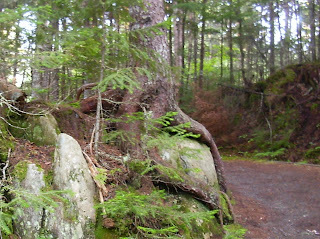 Both times we sheltered under the shoreline trees and then kept going. We ate lunch and swam on a small island, but I had no time to draw as the clouds were coming our way again. The camping there is wilderness camping to us because there are no electric sites. We kind of get spoiled with them, but really it's not so difficult without. Last year it was very cold there and we needed heat; this year we didn't. We plan to go later in August, and we have a solar panel that we will take to charge our battery in case we need the heat then. We unloaded as soon as we got in, but hubby and I were both so exhausted we flaked out. I had a nice bath since I was swimming in the lake in lieu of a shower. I did one sketch last night at our campsite which I still have to finish up. I used watercolor pencils and need to add the water to them. Perhaps, I'll show it later. 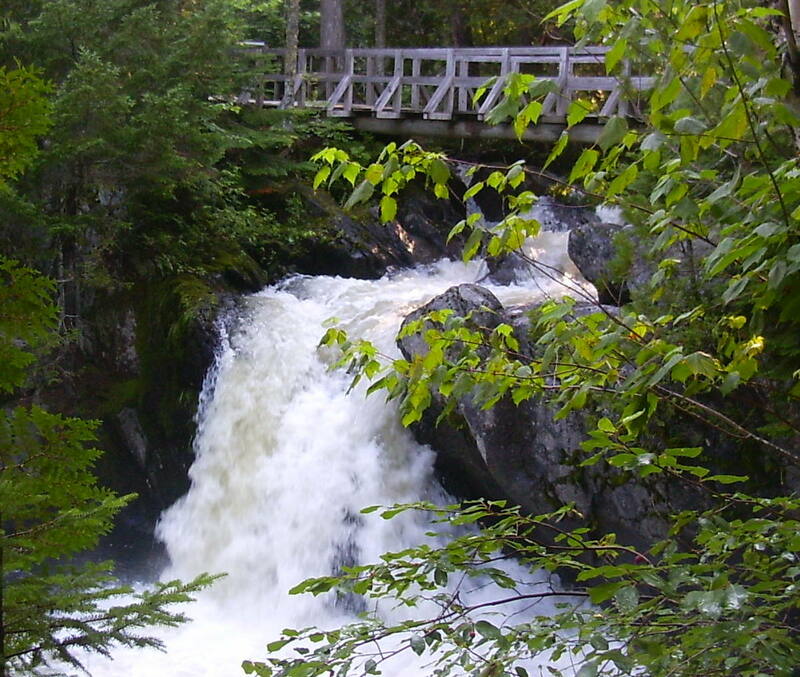 Here are a few pictures of our campsite , a lake vista and one of the falls that is a short hike. And, on the way to the falls On the walk to the fall, I took one picture of a tree with it's roots growing around a rock. 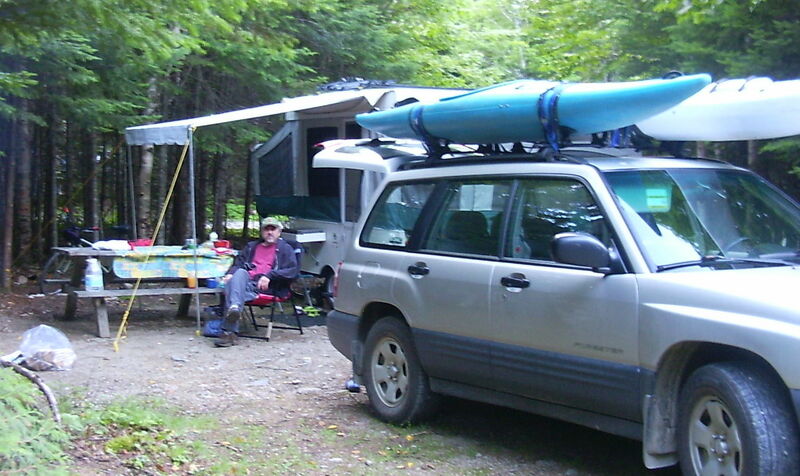 We are leaving tomorrow morning to go with the tent trailer to Mount Carlton Provincial Park here in NB. I'm almost packed. It's just a couple of days and I'm pulling as many things from the freezer as I can. It's not a huge amount of food for a weekend but the thing about Mt Carlton is that there is nothing else there, so if you forget something, you have to do without. I will try to take some pictures. We'll be back on Monday night. I hope they're better than these. I seem to need some basic photography lessons. This is my first wall hanging all finished except the border quilting and backing. It's crooked and a little blurry, but I think you can see it well enough. 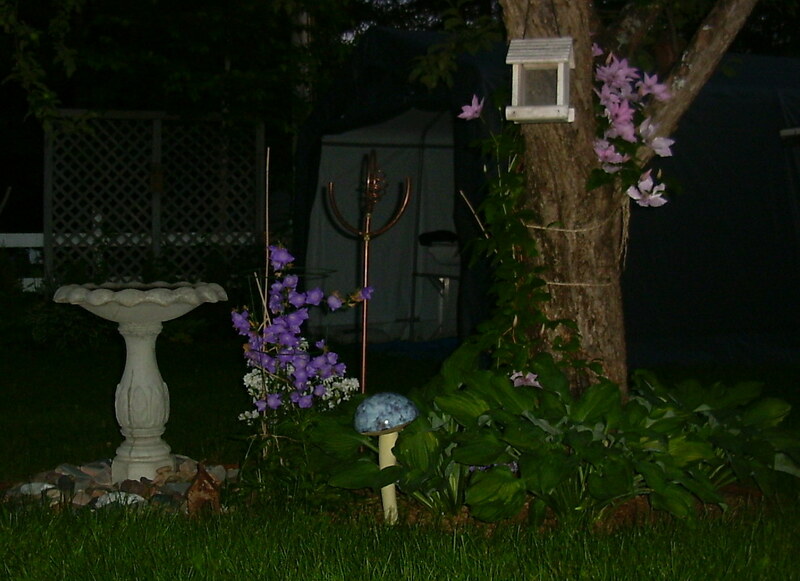 This is the little garden around my apple tree which I took when the sun was going down and it came out dark. I kind of like the affect though. 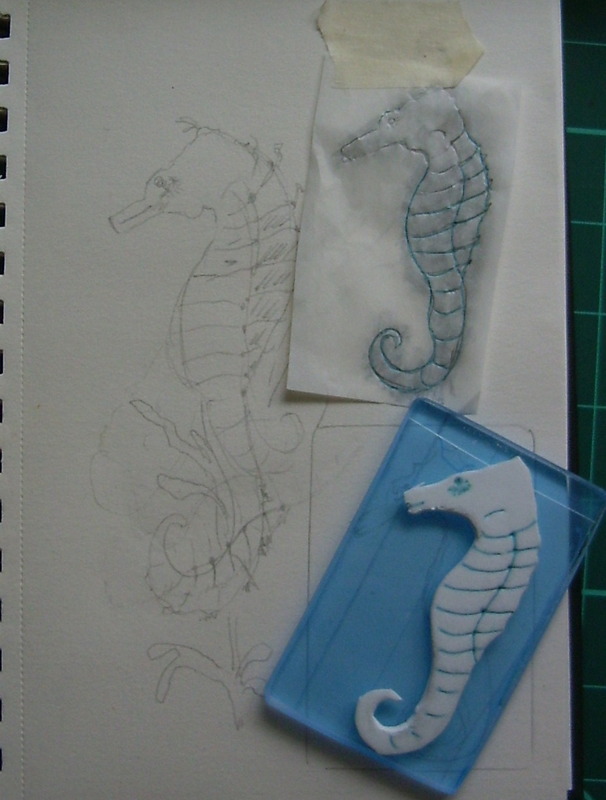 Here's another little bit of progress on my seahorse pieces. It was a tiny bit less muggy today and I got in a couple hours at the sewing machine. I started to thread paint the larger one--now I need to quilt it. 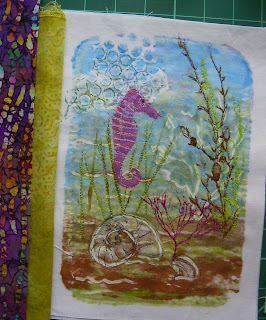 I laid a couple of possible border fabrics beside it. I hope you can see the details. Then I quilted the postcard and am ready to hand embellish. It's just in time for a day trip to a friends cottage tomorrow. It needs some hand embroidery and some beads and 'bling'. I am just no good in this humidity. I went for an early morning bike ride and swim at my favorite pool. It's a salt water pool, by the way, and very nice to swim in. Also, the bike ride takes only 7 minutes, so no great feat. I was so exhausted when I got home, I had to have an apple and rest before I could make lunch. after lunch-- a salad topped with leftover barbecued salmon-- I stretched out with the fan on me and read for awhile. I was only able to stand a short time in my sewing room before the seat was dripping off me. 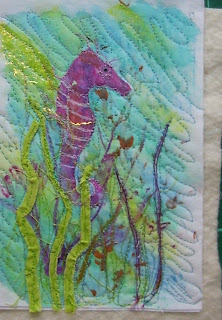 I did a little thread painting on the postcard size seahorse. 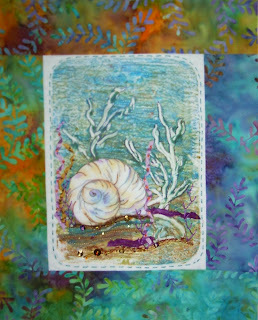 Tomorrow, I'm hoping to quilt it so I can take it on my vacation to do hand embellishing. It's supposed to rain tomorrow, but still be quite warm. I had another go at the seahorses today with a little bit of Setacolor fabric paint. 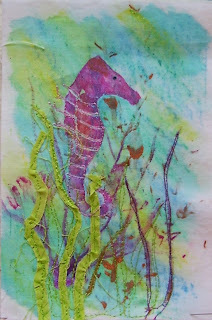 I used my pressed seaweed. It didn't work all that well but I think it will be just enough once I add the thread. My next step will be to thread paint a little and then sandwich it. 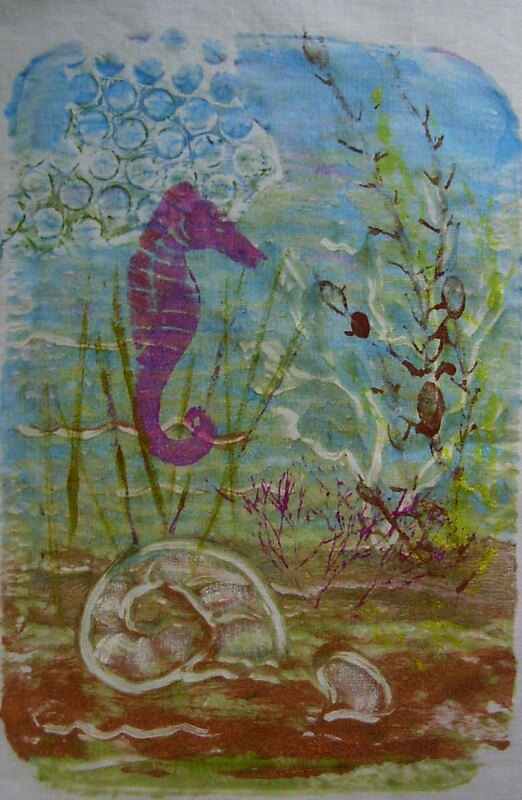 I'm not sure if the one with the seashell needs more or not. 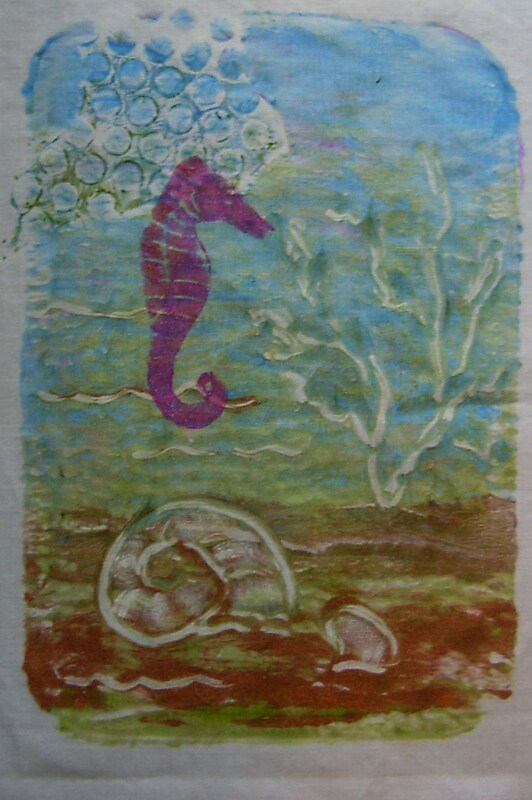 I may put some thread painting in front of it to obscure it a little more. The one on the left is only 4 by 6 inches and the one on the right is actually about 8 by 10. Whew, I just checked the outside temperature and it's 27.1C and very humid. coincidentally, it's was also exactly 27.1C in the house. Hopefully it will start to cool soon. At least I have air conditioning in the bedroom. I actually biked to the grocery store to-night for a few things. It's no great feat though as it only takes about 8 minutes each way. It was supposed to rain today, but it turned out to be a beautiful day. We took a chance, loaded our kayaks and headed for our favorite river, the Nepisiquit. On the river we stopped ashore on some rocks to eat our lunch which consisted of rye bread with peanut butter and jam, veggies and banana muffins. We also had a swim or two along the way. I always take my camera in a waterproof bag but forgot today. So here is the story of what we saw, and you'll just have to believe me. Among several sets of ducks, ducklings, geese and goslings, kingfishers, hawks, and a bald eagle, we actually witnessed a squirrel swimming across the river. This is quite a wide river and he did it pretty quickly--a good thing too, as it was shortly after that I saw the bald eagle fly over. I had no idea they could swim. Of all the days not to have the camera. After that we took some salmon to my in laws at the beach where we barbecued it and ate supper. We came home a while ago so my husband could go hit balls with his father at the golf course, and I've been playing a little in my room. 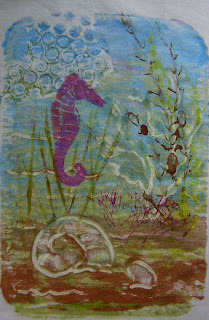 I tried my seahorse stamp on a practice fabric and then decided to print it on one of my mono prints. Did you ever do something and as soon as it's done wish you hadn't? Of course you have. 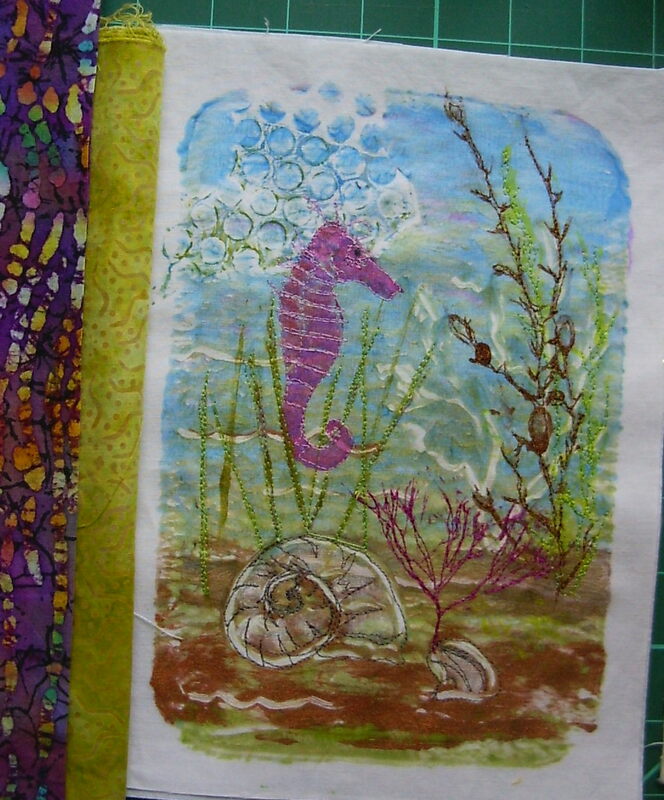 Well, I thought I was planning ahead when I tried the stamp on paper and then a small piece of fabric, and I thought I knew where I wanted the seahorse until I put it there. Then I realized there is too much focus on that side now. It's lined up with the shell as well. 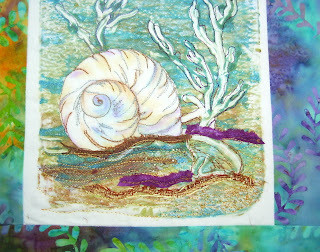 I may try adding some more seaweed to the other side and then embellishing, but I would hate to waste all the time if it doesn't work. 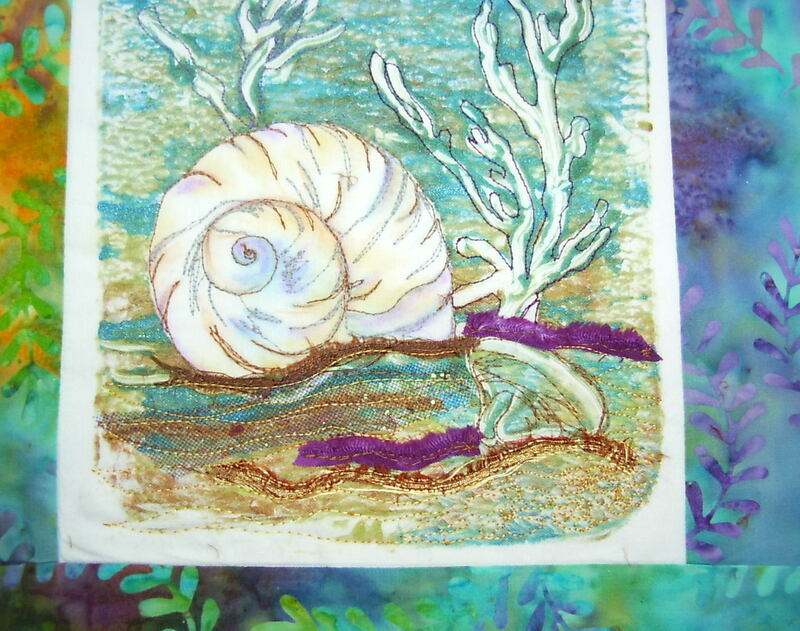 I think it might work if I put some ribbon embroidered seaweed to the right of the seashell. I've got to get out of this room for now; it's too hot! I bicycled to the Auberge this morning to do my swim in their salt water pool. I finally measured the distance. that I swim. I can do just over 600 meters. after that I do some water size exercises and then use the sauna. It's great--even as good a getting a massage. then I came home and had lunch, a short nap and got to work on this little hanging.. You'll remember it as one of my prints. I backed it with interfacing, bordered it, and started to thread paint. Then I put the batting onto it and started quilting. also, I've added some bits of scrap cottons and silk. 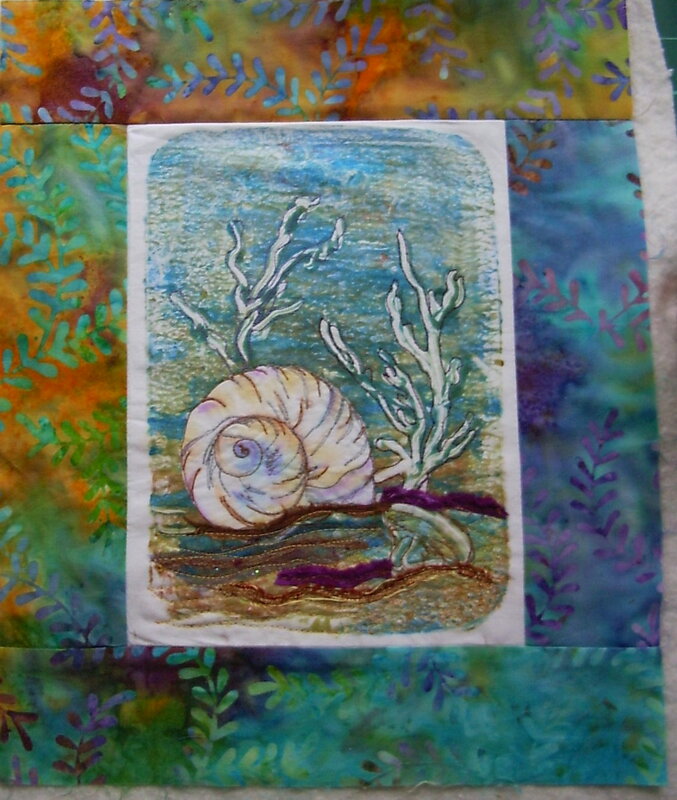 Once I finish quilting the top half I want to start hand embroidering with perle cottons and some silk ribbons for the sea weed. 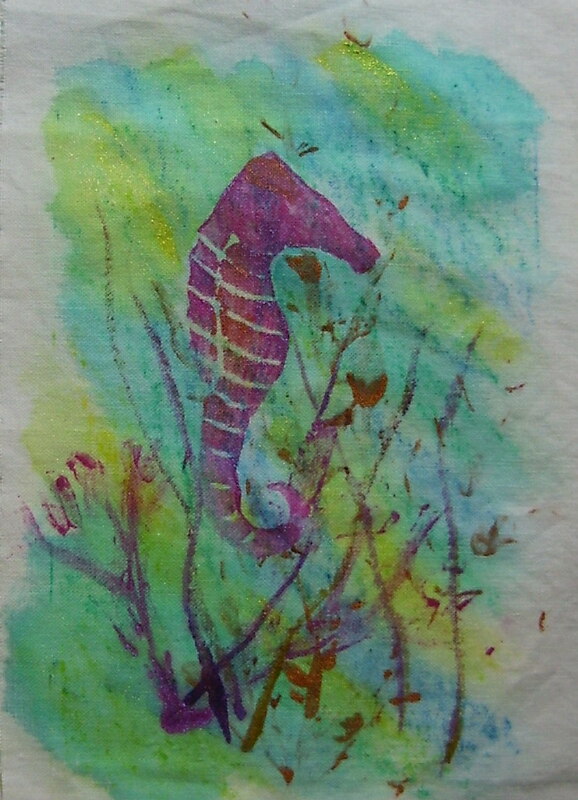 I sketched this little sea horse and made a stamp. I want to try it on one of the other prints that I did. 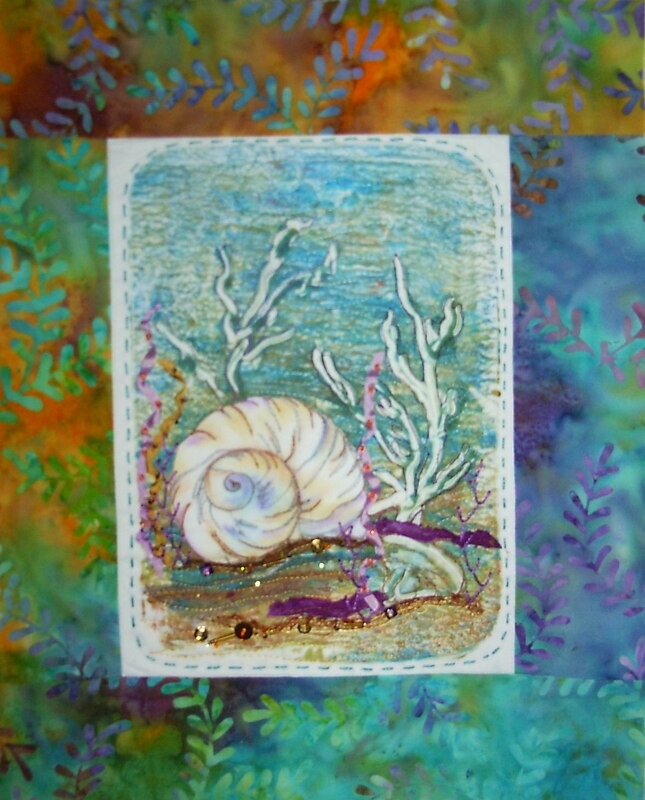 It also has a seashell, but less prominent and I felt it needed something. I didn't do very much that was sewing related today; it was too warm. Also, after finishing the housework, I went to visit a friend who lives at the beach for a bit this morning. There were small breakers which provided a wonderful background to the conversation, the water was a beautiful green color, and the salt water breeze was lovely. This afternoon, I put the finishing touches on the sewing machine cover and did a couple sewing repairs. It has not been a great week craft wise. Yesterday I cast off the sweater and discovered that it is really way too big, or was I should say, as I unraveled the whole thing while at the beach this morning.. At this point I think I will look for a child's sweater or something smaller to knit with the cotton. 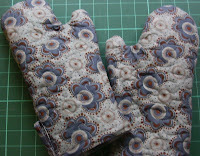 Next, I finished the oven mitts. Would you believe that I actually got a blister form trimming the seams? I persevered and got them finished, only to discover that I sewed one of the tabs onto the wrong side of the mitt. I might fix it someday. To-night we ate sandwiches of roasted vegetables and homemade hummus on a homemade rye bread that I took form the freezer. Yum! 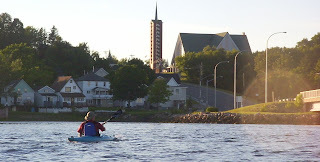 Then we went kayaking downtown. Here are a few pictures of our little waterfront. Both my son and my husband had 4 days off over the weekend, so I haven't done any sewing until today after my son left. I decided to make a pair of oven mitts since I got some of the insulated fiber from a friend and I've got lots of fabric...should be easy , right? They're just a tad more time consuming than I thought. The Teflon insulation is so thick that when you are putting 2 layers together, it's pretty difficult to turn them right side out. Somehow I even managed to skin a knuckle while doing it, and I broke a wooden thing that you use to turn things with. Anyway, they're almost done; it was an experiment that I probably won't repeat. Art quilting is more fun! My son and his girlfriend came with us to the grandparents at the beach for the afternoon and we cooked burgers and veggie burgers for supper. It wasn't the nicest at the beach yesterday, but after supper when the tide turned the sun came out and the water was beautifully calm. 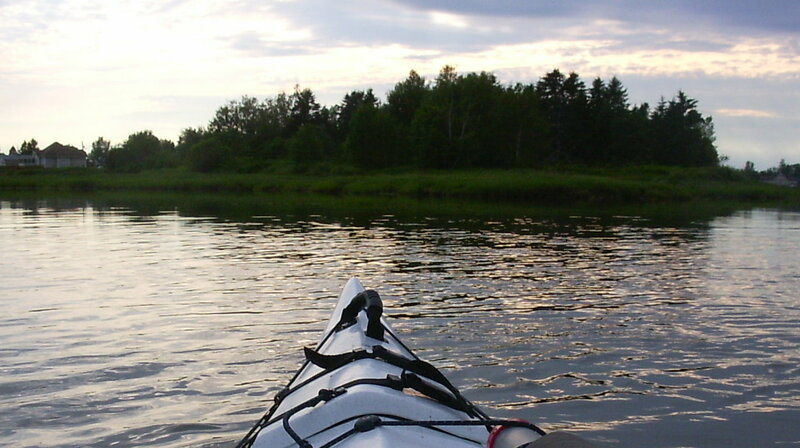 Here are a couple of pictures of our paddle in the kayaks. It was only my second time out this year. 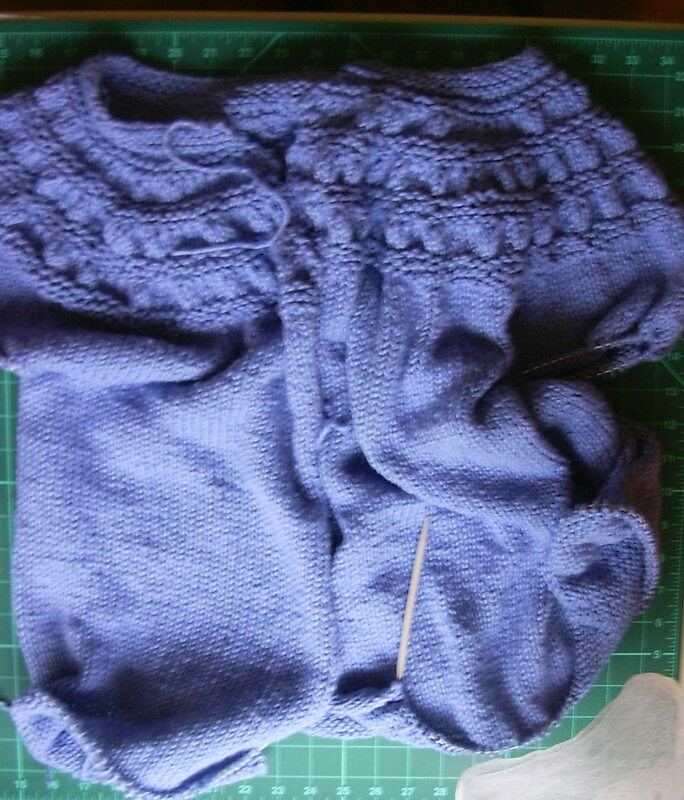 This is a photo of my current knitting project. Some readers might remember that I showed a yellow one--same pattern-- a few months ago. The cotton wrapped yarn was literally falling apart, so the shop replaced it with a different color. It's the same yarn but definitely better. It is knitted form the top down and I'm almost done and just have the sleeves left.